Apart from “Star Wars: The Force Awakens,” David O. Russell’s “Joy” is the last major movie of 2015 to screen for most critics, and though that’s largely because Russell was still putting the finishing touches on the film, its late arrival jibes with its wildly mixed reviews. Those fond of Russell’s loosey-goosey “American Hustle” style seem to be partial to his latest, yet another story of an American go-getter, this time a middle-aged striver played by Jennifer Lawrence and based on Miracle Mop inventor Joy Mangano. (Take “Based on” with a huge grain of salt: Casting the 25-year-old Lawrence in the role is a strong indicator of the movie’s attitude towards accuracy.) But the four editors who worked down to the wire don’t seem to have fully whipped the story into shape, or at least they don’t overcome what seems increasingly like Russell’s strategy of using visible screen energy to whiz past a lack of structure or depth. Given the film, and Lawrence’s, total absence from the last week’s spate of critics awards, it doesn’t seem like “Joy” will find much in the way of widespread critical favor — although given Lawrence’s massive starpower, that may not make much of a difference. Despite another solid performance from Jennifer Lawrence, anchoring Russell’s sincerely felt tribute to the power of a woman’s resolve in a man’s world, it’s hard not to wish “Joy” were better — that its various winsome parts added up to more than a flyweight product that still feels stuck in the development stage. The aim seems to have been to weave various familiar Russellian elements — offbeat comedy, familial discord, wheeling-and-dealing chicanery, and a playful hint of make-believe — into a loving testament to the ways in which women survive, and thrive, even in a world actively devoted to keeping them in their place. But at a certain point, “Joy’s” grand ambitions and feminist underpinnings can’t disguise the essential lack of dramatic purpose or direction at the movie’s core. Russell is known for finding his fast, frenzied movies in the cutting room, a tactic that has rarely let him down in the past, but the same brilliance eludes him here. With no fewer than four editors credited, you have to wonder if the continual whittling and reshaping of scenes ultimately whittled away what was most interesting about Joy Mangano’s story in the first place. It’s a strong lead performance from Lawrence, no question about it, with an interestingly inscrutable quality. It’s a character portrayal that’s all about strength – though I missed the comic zaniness and vulnerability of her appearances in “American Hustle” and “Silver Linings Playbook.” Joy is the one keeping it together because everyone surrounding her is a flake or a klutz or a loser. She has some wonderful set pieces: I loved her storming out of her dad’s car repair shop to the soundtrack of Elvis’s “A Little Less Conversation” and then relieving her feelings by blasting away with someone’s pump-action shotgun at the next-door shooting range. And she really does look sensational in a pair of supercool sunglasses. But I couldn’t help wondering if there was more to say about Joy Mangano and more for Jennifer Lawrence to give. 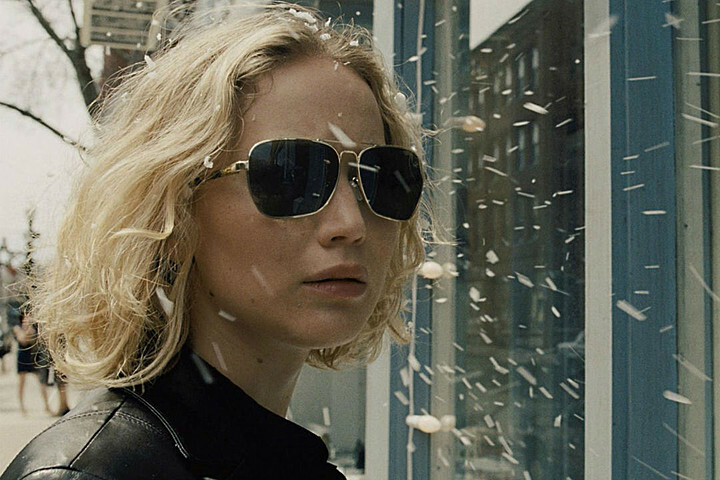 Since “Joy” is a David O. Russell film, the presence of a) Lawrence and b) bizarre, fizz-popping explosions of catharsis are to be expected. But the ringmaster of “The Fighter,” “Silver Linings Playbook” and “American Hustle” seems to have mellowed a little, which means fewer outright belly laughs, but a more layered and involving emotional landscape. While the Golden Age may be long gone, its spirit endures in “Joy.” It’s the best kind of actor-director collaboration. Take the sum of its parts, double it, and you’re almost there. David O. Russell’s third film in a row to have the good fortune of starring Jennifer Lawrence is nominally a story of perseverance and tenacity over ridiculous odds but spends much of its time examining the paralysis caused by the myriad vicissitudes and irrationalities of its madly neurotic, self-involved characters. That the film itself is nearly as chaotic as the clan it examines can either be regarded as an admirable artistic correlative or a crippling defect, but the splendidly dextrous cast ensures that this goofy success story, which could just easily be titled “American Hustle 2,” keeps firing on all cylinders in the manner of the writer-director’s previous few outings. In Russell’s best recent movies, the spontaneous combustion between lively temperaments — not to mention between actors who have been given the freedom to deliver big performances — can be liberating and infectious. But in “Joy,” the technique starts to feel like a gimmick, Russell unable to conjure up comparable improvisational pleasures. Too much of the film’s early stretches, though amusing and often likeable, seem like throat-clearing before we get to “Joy’s” most engaging element, which is the heroine’s quest to get her mop to potential buyers. Inside the black box that was the six-year gap between the eccentric “I Heart Huckabees” and “The Fighter,” Russell underwent something akin to a metamorphosis, emerging a writer-director of increased work tempo and superhero-proportioned Oscar ambitions. More than the oft-cited accusation that Oscar-friendly Russell is no bargain for losing the genius enfant terrible Russell of “Spanking the Monkey” and “Three Kings” fame, the more interesting struggle is in locating the latter in the former. Accolade-friendly or not, the director of “Joy” doesn’t sell the Edna Ferber-esque heights and depths of Joy’s journey without putting the enterprise through the paces of his impatient, liquid camerawork and feisty sense of humor. Lawrence fares better than her co-stars, who are underserved by Russell’s thin screenplay, and fall into two categories: gross caricatures (like Elisabeth Röhm as Joy’s shockingly cruel half-sister Peggy) or complete non-entities (like “Orange Is the New Black’s” Dascha Polanco, whose entire character can be summed up by the phrase “Joy’s best friend”). Still, Lawrence is all wrong for the part of a middle-aged mom who finally finds her niche despite the best efforts of her family of naysayers. And when she’s not putting the screws to the jerks trying to muscle her out of business, the movie feels like a glossy infomercial for the Miracle Mop and QVC; there;s more drama and heartfelt emotion about the American dream on an average episode of “Shark Tank.” “Joy” has none of the energy or precision of any of Russell’s recent efforts. Not even Joy Mangano could invent a mop good enough to clean up this mess.